Last edited by H311RA151N; 05-27-2015 at 07:09 PM. What I like is that they endorse you sharing the discount code. Who else does that? I'm using them more and more myself. 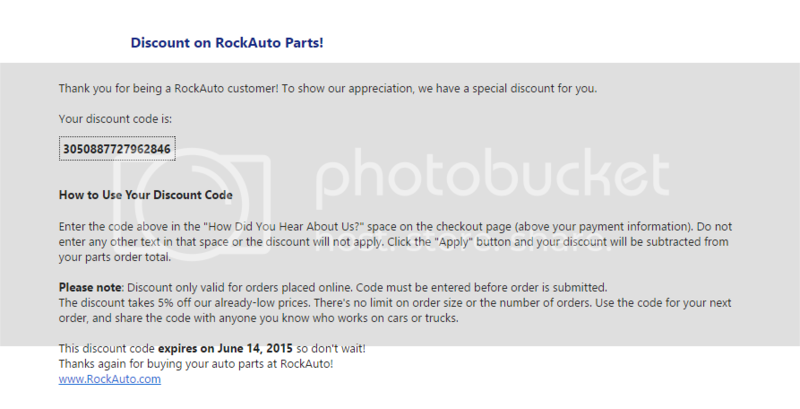 Finding an item you need/may need/will need that's listed on Rockauto as a Wholesale Closeout is like winning the lottery. I use eBay and Amazon. Cross referencing is key. I can't tell you the number of times I've bought a $300 car off craigslist, put $100 worth of RockAuto parts on it, and sold it for $1,000. If you use the "choose for me to minimize cost" feature and buy everything you need for a tune up at once you can get a lot done for very little $$$. New code anyone? Didn't receive an email for this month. Even updated my email on my account just to see if it would process an email through somehow. Nothing. Just in luck! Got a code that expires October 18, 2015. I seen it in my inbox today and didn't think anything of it as now I'm not needing anything. How it goes I guess. 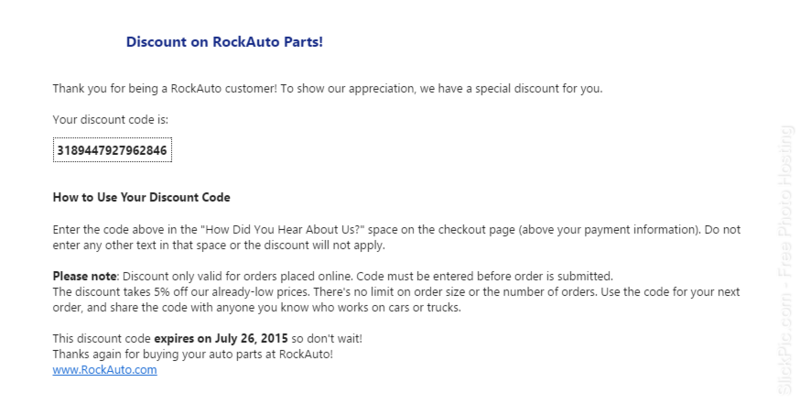 buy them parts for your car for the new year. I've ordered 3 times in the last month, and I haven't gotten any discount codes! I've used the ones you've posted, though... thanks cb9love!